Far-right PSL party candidate Jair Bolsonaro, a former army captain who has served in Brazil's National Congress since 1991, will head to the October 28 run-off vote with a wide lead amid an ever-rising tide of fake news that appears to have benefited his candidacy. Despite having purchased only eight seconds of TV time — in a country where television ads have historically decided the winner — Bolsonaro finished the first round of voting in first place with 46 percent of the total valid votes, against 29 percent for his leftist rival, Worker's Party candidate Fernando Haddad. He is leading the latest polls with the support of 58% of Brazilians. In his ascent from the fringes of Brazil's legislature to the doorway to the presidency, Bolsonaro has built a platform upon distinct sentiments of Brazil's collective psyche, leveraging a fear of communism that traces back to the Cold War-era and Brazil's US-backed military government. His divisive, emotionally-driven campaign promises to protect national politics from corruption and city streets from criminals, as part of a return to Brazil's allegedly placid past. 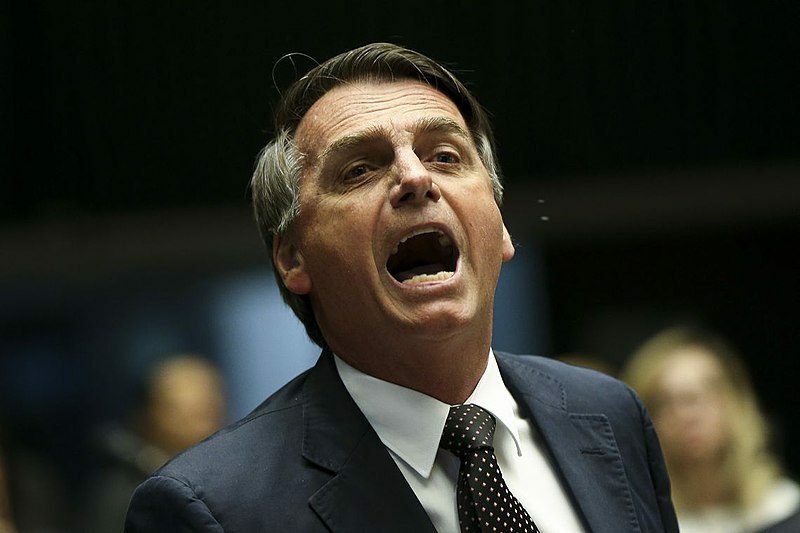 Bolsonaro openly expresses misogynistic and homophobic views. He openly praises the torturers of Brazil's military dictatorship. He has called for his political opponents to be shot. He recently vowed to “put an end to all activism in Brazil“. And he has declared he will not accept the elections results if he loses. Although his campaign season has been anything but typical — Bolsonaro has barely been seen in public since September 6, when he was stabbed and critically wounded at a rally by an opposition supporter — his message appears to have reached millions of Brazilians that rely on Facebook and WhatsApp as their primary venue for reading the news. He has also taken to Facebook on his own terms, broadcasting brief messages via Facebook live. In July 2018, Facebook banned 196 pages and 87 profiles, several of which were associated with the conservative group Movimento Brasil Livre (Free Brazil Movement, or MBL) and, according to Facebook, acted as a single network of distribution. MBL has played a pivotal role in the rise of online conservatism in Brazil, having led the demonstrations in favor of the impeachment of ex-president Dilma Rousseff in 2015. Several leaders of the group have officially declared support for Bolsonaro's candidacy. In December 2017, the court announced plans to establish a Consultative Council on Internet and Elections, under the auspices of the court. The Council would oversee the design of a tool, most likely a mobile app, for users to report suspicious content, and propose legal mechanisms to suppress the spread of fake news. But these measures hardly came to fruition. The Council has met only twice since its inception — once in June, before the campaign period began in August, and a second time on October 10, after the first-round vote had concluded. The plenary court never approved any directives to guide new regulations around false information and no app or other digital tool was released to the public. Members of the Council seem to have conflicting views about why these efforts failed. Council coordinator and general-secretary of the court's presidency Estêvão Waterloo told news website UOL that the impact of fake news on this election was not as bad as expected. He said: “Even though people say the landscape is [worrying], back then we anticipated it would be infinitely worse”. The fact that three different justices have presided over the court since December 2017 might have played a role too. The court's current president, Rosa Weber, said at an October 7 press conference that the electoral justices are still “trying to learn what is a fake news [story]”. After the meeting on October 10, the Council announced it will be launching the promised app for reporting dubious news, as well as a website where users can report content to the Electoral Court. But with less than three weeks remaining until the second round vote, it is unlikely that such last-minute measures will produce any substantial effects.